Last month Wired started a new blog, Wired Reread, wherein they look back at ads and articles in old issues. Some, like the beauty above, are pure gold. Ah, MiniDisc. 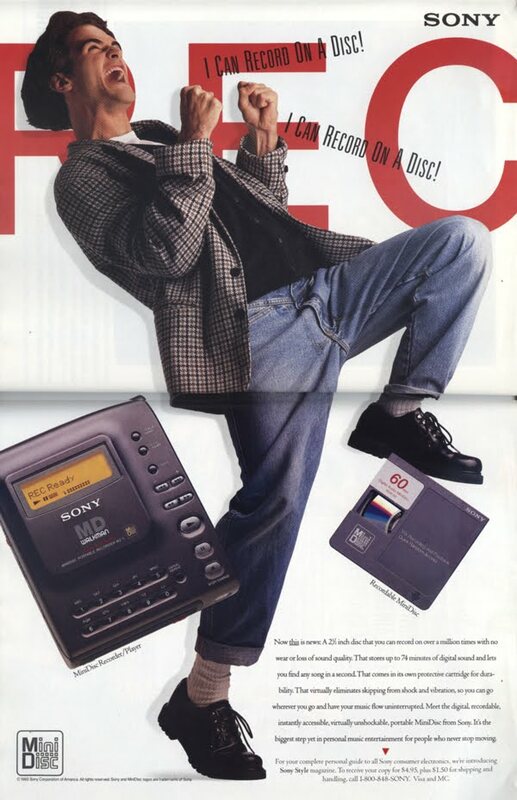 I remember my friend’s older brother had a MiniDisc player. I thought he was so hip to the new technologies. In the future no matter where you are, the nearest phone will be close at hand. Miniature. Wireless. Small enough to wear on your wrist. Yet powerful enough to reach anyone. Anywhere in the world. The strap-on telephone. The company that will bring it to you is AT&T. Got most of that right. I’m a little uncomfortable with the “strap-on” part, though. And will we ever be able to thank Motorola enough for loosing us from the shackles of fax stacks? Imagine, you would be swimming in those half-glossy curled sheets right now. The horror. This entry was posted in Gadgeteering, Shoot the Messenger and tagged at&t, cell phones, fax, minidisc, motorola, wired, wired reread. Bookmark the permalink. For the record: I absolutely loved, and still have, my mini disc.